Indra Puja is a unique ritual observed in the Mithilanchal region in North India and is dedicated to Devendra or Indra, the king of demigods. In 2019, Indra Puja begins on September 15. In most places the festival is a ten-day affair and is held during the Krishna paksha, or waning phase of moon, in Ashwin month as per traditional calendar followed in North India. In Bengal the festival is known as Indra Parb. 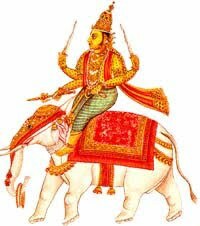 Indra was widely worshipped by people earlier as it was believed that it was he who created rains and thunder. The end of the worship of Indra came during the incarnation of Vishnu as Sri Krishna. It was Krishna who asked the people of Vrindavan to stop praying to Indra. An angry Indra sent torrential rains flooding Vrindavan but the people and their cattle were rescued by Krishna who lifted the Govardhan hill and gave them shelter. Special pujas are held during the period at the Baba Baidyanath Dham at Deoghar.